Notifications are sent automatically when assigning an issue and when adding users to a Project. 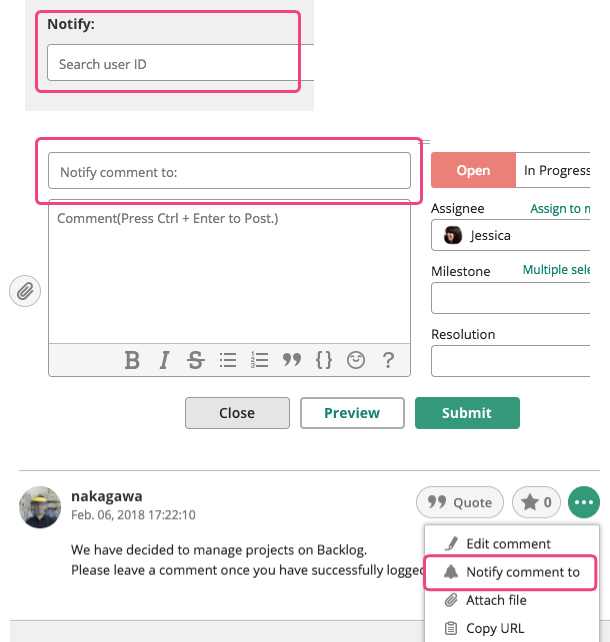 You can also choose to send notifications to specific users when adding issues, comments and files. Notifications can be sent even after posting comments by clicking the menu button and clicking “Notify comment to”. The user who receives the notification will immediately be alerted in the global menu. Please refer to Notifications for details. At the very top of the list is the "Participants” label if there are 2+ participants. This option lets you choose to notify all current and previous assignees with one click.